Crime Clusterf@$k/Political Pantomime 21mts, 3dys: Panic at the Disco! Is real Panic at the Disco for the People's Panchayat! 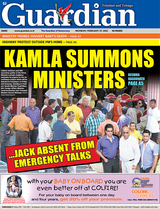 Kamla summon her whole deck of cards.....except Jack! The Government that has never stopped campaigning is going into hyperdrive this week. All because the Keith of Rowley and his paltry band of 10...wait, 9, because Patos on the road to recovery....are about to deliver a No Confidence Motion???? Surely in a partnership that is stronger than ever, with a slew of ministers who performing so efficiently and a the hardest working Prime Minister in the world Queen Kamla can't posibly be afraid? So then why 3 public meetings this week? To avert what? To explain what? You aint even make 2 good years in government yet and you already have to convince YOUR constitutents? Water more than flour boy! Mind you Scott Drugg Report Rambachan is insisting that the govt not panicking and instead trying to make out that the Balisier Tie Affair is a larger issue. Drugg Report Rambachan also trying to convince us that the group of activists who petitioning for a shift in the highway route also asked the PM to hold public meetings of national importance. Desperate much? While the Panchayat's inner circle running like headless chicken to drum up support and figure out what The Keith has up his sleeve, Principal Sita Gajadharsingh-Nangar fights with a security guard and the Minister of Women's Unmentionables indicates "It wasn't us!" It appears that this Principal won't get a break. The Maha Sabha and its supporters continue to attack her and people continue to give them their support. What is happening to Gajadharsingh-Nanga is abusive and illegal....but not a voice has been lifted in condemnation of Sat! In the latest We Were Never Going After Calder Hart news, the probe's chief investigator is going on 21 months leave....like he in government? I wonder where An& Ramlogan these days? What really has this AG of ours achieved since he get into government? And it seems Glibbs under fire for stalling too. Glibbs you will never get fired, boy...you are too good a Fall Guy. By tomorrow they go blame you for the KFC Baby death...watch and see! The country's murder toll hit 61. But the kuchoor in the politics so intense people don't even have time to pay attention to who get murdered these days. TCL strike to hit tomorrow....well let me see how the government dealing with a strike and no-confidence motions and Glibbs and Vasant and Jack and whatever else gets thrown at them this week! Is the hunt on for a new SSA head? Government have 3 more days before the current contract expires...are they making a move to renew or replace? Any family members applied? Eviction for former SAUTT head?